Sending warm holiday wishes to our clients and friends. Thank you for another great year of working together to build your businesses and protect your brand names. We are most thankful for our clients, friends and family who make it all possible and worthwhile. As we get wrapped up in the busy-ness of the holiday season, take time to savor the spirit of the season – togetherness, gratitude and quiet reflection. As you make your lists and check them twice, remember to give not only presents this year, but also, your presence. Wishing you happy holidays and continued success for the New Year! 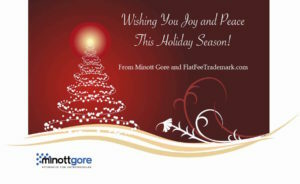 From the attorneys and team at FlatFeeTrademark.com and Minott Gore, P.A.